Add your site to the Internet's largest and most popular directory of products and services for old house owners and contractors. To gain maximal exposure to your target audience we also offer paid listings on a CPM or pay-per-click basis. Unlike a free listing, our paid listings can include a photo, your logo, and a more lengthy description. They also appear at the top of search results in the Guide. Our Featured Listings (the top listing in each category) benefit from highest placement in the relevant category page. Cost is based on an affordable CPM model with rates ranging from $25 to $50 depending on the product category. Preferred Listings run prominently above free listings and below the Featured Listings. You're only charged when someone clicks on your listing to visit your company's web site and you can cancel at any time. If you'd like to maximize your exposure through one of our Featured or Preferred Listings programs, please e-mail us at advertising@oldhouseweb.com or phone (888) 943-8348. Click here for full details about our Featured and Preferred Listings programs. Free listings are limited to one per company. No exceptions. If your company is already listed in our Guide, do not submit a second listing. Do not disguise your URL, and do not submit mirror sites. We care a great deal about the quality of our Guide to Suppliers, and we are highly selective about who we list. So please don't take it personally should your site not be accepted. Our goal is to make the directory as useful as possible for our users. We reject submissions with incomplete contact information. It is especially important that you provide a real e-mail address where we can reach someone if we have a question. 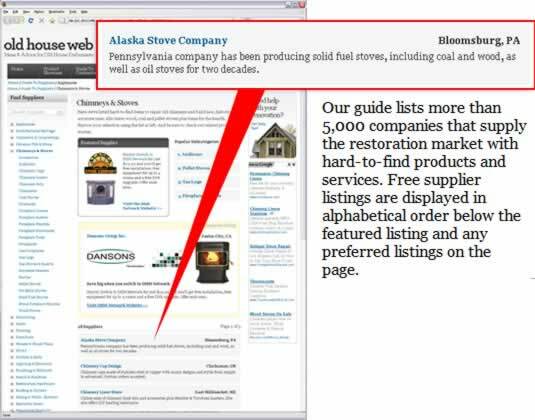 The Old House Web may (but is not required to) use information and images from your site or other sources as the basis of Product Stories for our Product Showcase section. By submitting a listing to us, you represent and warrant to us that the information posted on your site or otherwise provided to us is accurate and complete and that any intellectual property rights attached to such information (for example, trademarks, logos and copyrights to photographs) are owned or validly licensed by you or are in the public domain. You agree to notify us promptly upon discovering any incorrect or misleading information in any Product Review we create based upon your site or information provided by you. Additionally, to the extent that any proprietary rights attach to such information, you grant us a non-exclusive, fully-paid-up, royalty-free, sub-licensable, assignable, worldwide license to use such information on The Old House Web for the purpose of writing one or more Product Review based on such information, and that such license shall be irrevocable during the period that your site remains listed on The Old House Web. The content of any Product Review shall be determined by us in our sole discretion. Any proprietary rights to any Product Review will be owned by us, even if your site is no longer listed on The Old House Web. Descriptions should be concise and accurate. They should not be promotional in nature. Describe the products and services your company offers. Submitting a promotional description rather than an informative description may prevent your site from being listed at all. These rules may change from time to time at our sole discretion. You agree by your continued listing of your site on The Old House Web to any modification to these terms and that The Old House Web will not have any duty to notify you of any changes to these terms and that your sole recourse to disagreement with any term specified is to terminate your free listing on The Old House Web. Unless and until you terminate your free listing, you will be deemed to have consented to any change in terms. An editor from The Old House Web will review your submission to determine whether to include it in the directory. Depending on the volume of submissions, this may take several weeks to a month or more.